The 2014 World Cup second semifinal features yet another previous World Cup Final match-up with these two teams having faced one another back in 1978. This was the Netherlands second final in a row, but resulted in a 3-1 Argentina win in extra time. This time around Holland doesn’t have quite the same talent as that previous squad, but their teamwork and effort has carried them to their second consecutive World Cup semifinals as well as their fifth in their history. Argentina is one of the eight teams to ever win the World Cup having been champions in 1978 and 1986. They will be playing in their third semifinal in their history and the first since their 1990 Final loss to West Germany. This match is shaping up to be one of interesting story lines. Argentina will be without attacking midfielder Angel di Maria, who is out with a torn thigh muscle. They lose him just as he was starting to pick up his game, but are hopeful that Gonzalo Higuain will step up following his excellent goal against Belgium. Belgium’s manager, Marc Wilmots, was mostly correct in saying that this Argentina side is normal. The difference so far has been Lionel Messi. While he may not have scored since the group stages, his presence on the pitch is such that he will always pull defenders and create space for his teammates. On the other side of the pitch has been Netherlands Arjen Robben. His pace and ability in tight spaces has been nearly unstoppable. He has played all 486 minutes of Holland’s five matches and in that time has completed 84% of his paces as well as scoring 3 goals with 89% shot accuracy. This compares to Messi’s 4 goals with 47% shot accuracy along with 82% pass completion. Both players have one assist apiece while Messi has played 18 key passes and Robben 14. Both of these players will be key in this match and in determining the outcome. I’m expecting the Netherlands team to set up similar to the way they did against Mexico, but will most likely press much more often and will need to dedicate more resources to stopping Lionel Messi, most likely having someone like Daley Blind marking him throughout the match. 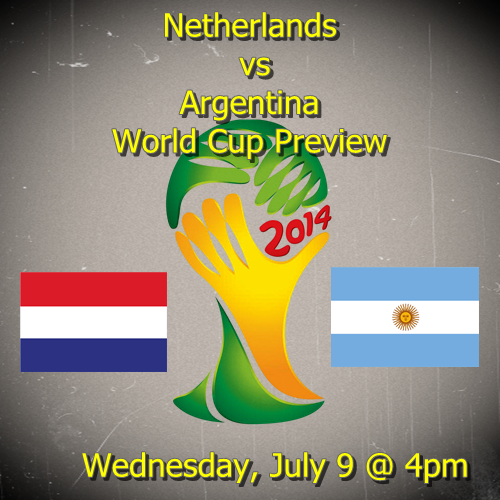 My prediction is a Netherlands win. While I’m predicting it in normal time, this might be due to my fan bias. Argentina will not be easy to get past and will have most of the possession with the Netherlands sitting back for much of the game then looking to quickly counter. This will be fairly similar to the match against Mexico in which they looked to conserve energy for most of the match then press much harder towards the end of the half. If they fall behind I would expect van Gaal to make positive changes from a 5-3-2 to a 4-3-3. 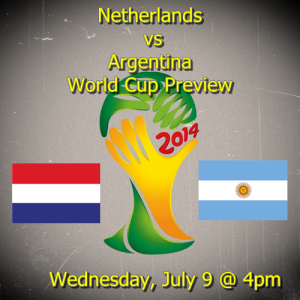 Argentina will play a mostly attacking minded 4-2-3-1, but so far have had difficulty breaking teams down. The loss of di Maria will not help and they could change formation to more of a 4-3-3. Wednesday’s weather probably favors Argentina more. The predicted forecast is calling for rain while the temperatures will be in the high 50’s. The difficult part will be the added humidity of up to 85% in addition to the rain. It will not be a comfortable match for either team.